Shower and tub combinations may take up less space, but they can look clunky. They can also make your experience using your bathroom a frustrating one if that particular combination isn’t what you want. When remodeling your bathroom, you have the opportunity to replace a clunky shower/tub combination with a much more enjoyable walk-in shower unit or free-standing bathtub. Generally, walk-in shower units are the more popular option. Plus, they can be customized with a variety of tiles, shelves, shower controls, fixtures, and more, so you’re able to get exactly what you want. If you have a larger bathroom and want to have the option for a soak, you can always add a free-standing bathtub in another area of your bathroom in addition to your walk-in shower unit. This allows you to add a spa-like element to your bathroom and is a popular option for larger master bathrooms. The vanity is a necessary part of any bathroom. It usually contains the sink, is below the mirror, and also can contain storage. Replacing your current bathroom vanity with an upgraded version is a great way to upgrade your bathroom during a remodel. You have the option for a single or double vanity. 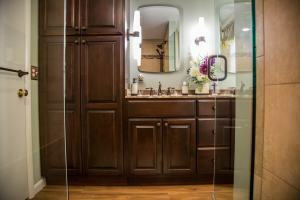 Additionally, you can customize every part of it from the sink and the fixtures to the cabinets, drawers, and mirrors. Upgrading the vanity is a great way to add more storage to your bathroom during a remodel as well. When it comes to remodeling your bathroom, you can upgrade certain parts of it or do a complete overhaul. In either situation, why not get creative with the lighting? Lighting in any room helps create the atmosphere in it and affects the overall look and feel. Plus, there are plenty of bathroom lighting options available! You can add wall sconces to either side of the mirror to make getting ready in the morning a breeze. You can also upgrade your bathroom with elegant overhead fixtures. It’s even possible to add a chandelier to your bathroom if you’re looking for a more formal look. Old or outdated toilets tend to use more water and are less energy efficient. If you’re planning to remodel your bathroom, think about your toilet. You can always replace a toilet seat if needed or go with a brand new toilet to give your bathroom a new look. Choosing one that is low-flow and low-energy or even an electric-powered hatbox toilet can help your bathroom look better and become more energy efficient too. It’s easy to get distracted by all the big items during a bathroom remodel and leave the accessories for last or forget about them entirely. But, the accessories are often the finishing touches your bathroom remodel needs. Accessories can be anything from paint and paneling to towel bars, other bathroom fixtures, and seating. Your walk-in shower unit can feature custom decorative tile and include a shower bench or chair. A cushioned ottoman, chair, or bench could be the perfect addition for an area beneath a window or near the vanity. The possibilities are endless! There’s a lot to think about when it comes to bathroom remodeling and trying to manage all the details can be overwhelming. Partnering with an experienced home improvement company can help you handle the details and keep the process an exciting one. Contact Zephyr Thomas at 717-399-4708 for help with your bathroom remodeling project!